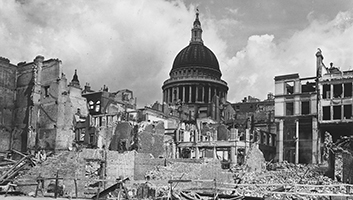 Brexiters who repeatedly affirm that Britain will survive a no-deal Brexit because they survived The Blitz have been reminded that there were one or two casualties during that period in time. With the possibility of a no-deal Brexit looming and increasing fears over food and medicine supplies after March 29th, many Leave voters have taken to telling anyone who will listen that fears are unfounded because Britain survived the Blitz, and therefore the little matter of walking away from one of the largest trading unions in the world is no big deal. Brexiter Simon Williams, who was born in 1958 and technically therefore didn’t ‘survive’ either of the World Wars took to social to media, saying ,”We survived The Blitz, won two World Wars and beat that German lot once in a game of football. “I was only eight at the time, and I was drunk when I was watching it so barely remember the game itself, but I’m told it was a complete drubbing of those continental bastards. “A no-deal Brexit, like The Blitz, might cause a bit of disruption for the first week or so, but no-one will die, mark my words. Historian and whingeing remoaner Christopher James told us, “Unfortunately, there is a trend of viewing historical conflicts through rose-tinted glasses, but sometimes the rose tint comes from blood splatters.